Prime Minister Rt. Hon. 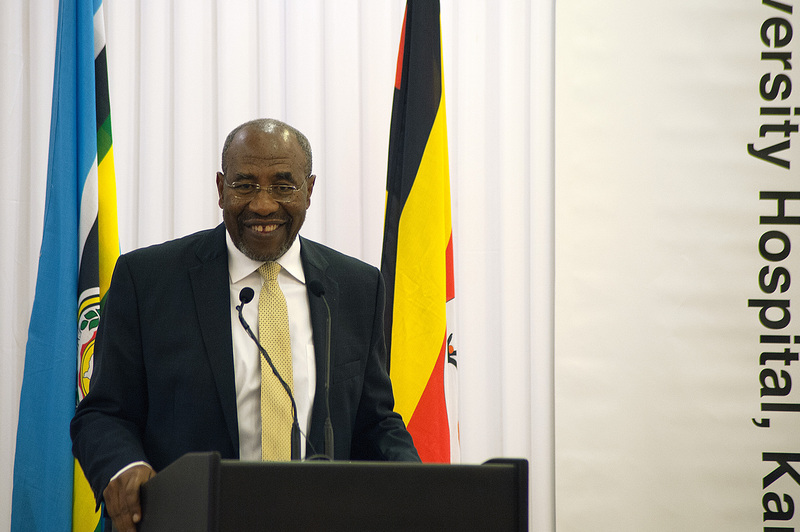 Dr. Ruhakana Rugunda speaking at the Ground Breaking Ceremony for Aga Khan Hospital. On behalf of President Yoweri Museveni, I would like to thank His Highness the Aga Khan for your long-standing commitment to the social and economic development of Uganda. This morning, HE President Museveni conducted a very significant ceremony of breaking the ground for the construction of Aga Khan University Hospital. It is significant because Government is committed to providing quality healthcare to our citizens—and this collaboration with the Aga Khan is part of that endeavor. I would like to salute the Aga Khan, because in every area that His Highness works, whether it is building the Bujagali dam, or the Serena Hotel, we always see a mark of excellence. I am confident that the Aga Khan University Hospital will be at the same level of excellence, if not even higher. We have had an opportunity to witness the great quality of service of Aga Khan enterprises and have no doubt that the Hospital will be in the same league. For instance, in 2013, while in the Ministry of Health, I led a senior ministerial delegation to visit the Aga Khan University Hospital in Nairobi and the University’s regional campus site in Arusha. This is where we saw first hand what an institution of this nature can do to raise healthcare standards in a country. We expect this Hospital to be completed as quickly as possible so that Ugandans can start to enjoy gold standard health services the Aga Khan is well known for. We believe that with investments such as this, and many others by the Government and other private sector actors, we shall soon be able to have all healthcare needs attended to from within Uganda, with no need to spend time and money going for treatment abroad. The Aga Khan hospital will save lives. Its impact will be felt not only in Uganda but in the entire region. The Aga Khan University Hospital will do for healthcare what the Serena has done for hospitality in Uganda. I welcome this investment which will have a ripple effect on development throughout the country, improving quality of life for all.